Wyatt Earp moored on the edge of Antarctic pack ice, February 1948. The little wooden ship – with a very unlikely name – pioneered Australia’s expeditions into the Antarctic as part of the Australian National Antarctic Research Expedition (ANARE). ANMM Collection ANMS1445. 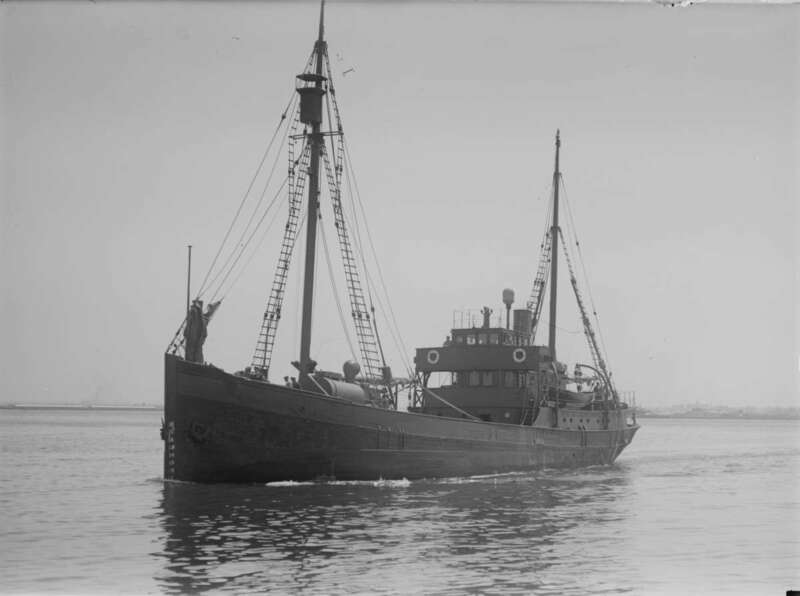 On 26 December 1947, a small, nondescript wooden-hulled motor vessel set off from Hobart, bound for Antarctica. Its silhouette resembled that of an ageing offshore fishing craft, but its weather deck was packed from stem to stern with supplies and equipment – including a single-engine Vought-Sikorsky Kingfisher floatplane. At the helm was Commander Karl E Oom, an officer in the Royal Australian Navy (RAN). He was supported by five naval officers, 22 ratings, a Royal Australian Air Force pilot and air fitter mechanic, and an Australian Department of Information photographer. The complement was rounded out by four civilian scientists who were responsible for conducting a series of experiments, and observing meteorological and other natural phenomena in the Antarctic. 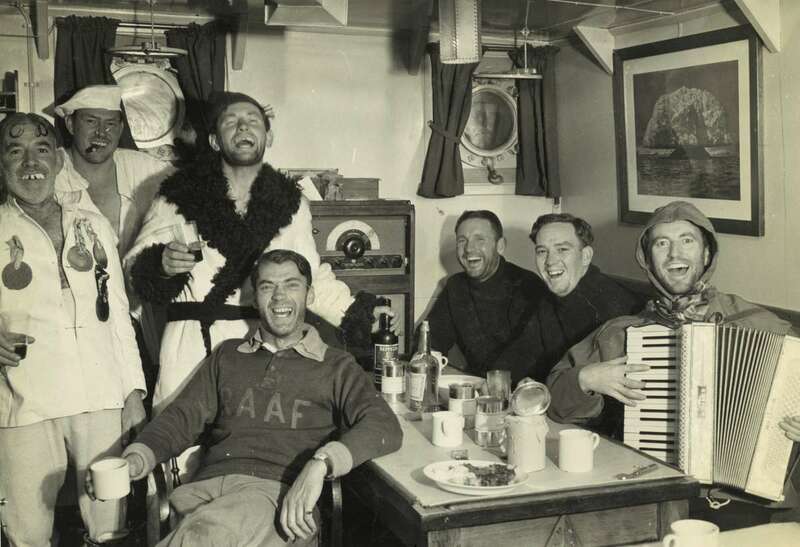 Their voyage would be the first to operate under the banner of the Australian National Antarctic Research Expedition (ANARE), a series of post-war initiatives to establish Australian scientific research stations in Antarctica and the sub-Antarctic territories of Heard Island and Macquarie Island. ANARE laid the foundation for the establishment of the Australian Antarctic Division, and in later years Australia’s polar research ships could trace their lineage back to the little timber craft then making its way towards the world’s southernmost continent: HMAS Wyatt Earp. Australia’s most improbably named naval (and polar research) vessel began life as Fanefjord, a specially designed herring fishing craft named for a 20-kilometre-long fjord east of the Norwegian shipbuilding town of Molde. Its single-decked timber hull was constructed of pine and oak and launched from the ways at Molde’s Bolsønes shipyard in 1919. It was 135 feet 7 inches (41.3 metres) in overall length, had a beam of 29 feet 2 inches (8.9 metres), a 14-foot 4-inch (4.4-metre) draught and a displacement of 402 tons. In 1933, Fanefjord was acquired by American explorer Lincoln Ellsworth for his inaugural 1933–34 Antarctic expedition. Ellsworth refitted and sheathed the vessel with oak and steel armour plate and renamed it Wyatt Earp after one of his childhood heroes, the legendary marshal of the towns of Dodge City and Tombstone in the American Old West. Ellsworth was a wealthy adventurer who trained as an aviator during World War I and later funded and accompanied two polar air expeditions (in 1925 and 1926) led by Norwegian explorer Roald Amundsen. The second journey, which embarked aboard the airship Norge, sighted the geographic North Pole. In 1930, Ellsworth met Australian polar explorer Sir Hubert Wilkins. The two men became fast friends and began planning an expedition to Antarctica. Wilkins was assigned the task of finding a suitable vessel, and purchased Fanefjord during a visit to Norway in 1933. He then transferred the ship to Ellsworth and would go on to act as the American’s trusted technical advisor and expedition organiser. 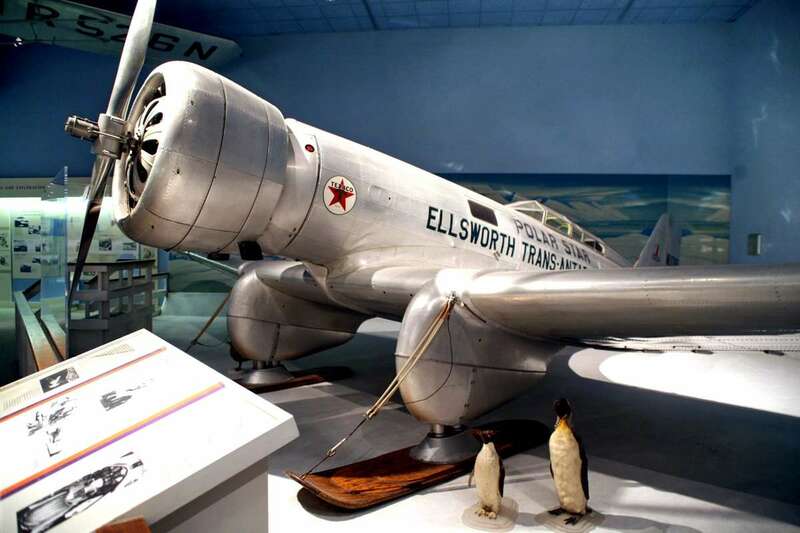 Inspired by Amundsen’s expeditions, Ellsworth led four of his own to Antarctica between 1933 and 1939, aiming to explore the continent by air and conduct the first trans-Antarctic flight. Wyatt Earp’s main role was to serve as a base ship for Ellsworth’s aircraft; the first of these, a Northrop monoplane named Polar Star, was successfully used during the 1933–34 expedition, but only after Wyatt Earp was safely navigated through heavy pack ice and survived being icebound for 13 days. Polar Star was again used during Ellsworth’s second and third expeditions, and it was during the latter (in late 1935) that he and his English pilot, Herbert Hollick-Kenyon, attempted to fly across the continent from the Antarctic Peninsula to Little America, one of Richard E Byrd’s abandoned bases on the Ross Ice Shelf. The trip was often beset by bad weather, and after two weeks Polar Star ran out of fuel before reaching the base. Ellsworth and Hollick-Kenyon completed the trip only after a harrowing 11-day journey on foot. Eventually they were retrieved by a search party in mid-January 1936. Other than Byrd’s 1929 Antarctic flight and the overland journeys of Scott and Amundsen to the South Pole, Ellsworth’s 1935 flight penetrated further into Antarctica’s interior than any other expedition before it and is considered the first successful transit of the continent by air. Polar Star is seen in the bow of Wyatt Earp as the vessel’s crew searches for a take-off field along the Antarctic Archipelago. ANMM Collection ANMS1445. Polar Star is now part of the Smithsonian National Air and Space Museum. Image via Wikimedia Commons. Ellsworth’s fourth and final expedition in 1938–39 again used Wyatt Earp as a base ship – this time for a Northrop Delta monoplane and a small Aeronca two-seater aircraft to act as a scout. Both planes were outfitted with wheels, pontoons, skis and two-way radios. From the outset, the weather was abysmal, and it took 45 days just to work the vessel through some 800 miles (1,287 kilometres) of pack ice to reach the Antarctic coast. Despite the conditions, the Northrop monoplane undertook two flights, the second of which penetrated 210 miles (338 kilometres) inland and resulted in Ellsworth making territorial claims for the United States. Following the serious injury of a Wyatt Earp crewman, Ellsworth abandoned the expedition and the vessel survived heavy pack ice and seas to arrive safely in Tasmania in February 1939. Wyatt Earp was put up for sale and purchased by the Australian government shortly thereafter. The ship was then transferred to the Royal Australian Navy (RAN) and renamed HMAS Wongala. After serving one voyage as a Fleet Auxiliary, it was reassigned as an examination vessel in Port Adelaide, and subsequently as a guard ship at the South Australian port of Whyalla during World War II. Wongala paid off at Port Adelaide in July 1944 and was slated for disposal when the South Australian Branch of the Boy Scouts Association petitioned the RAN to make it available for sea cadet training, which was granted. Three years later, the Department of the Navy notified the Boy Scouts that the Commonwealth government wished to assess Wongala and determine its suitability to participate in Antarctic research. It returned to Port Adelaide, where it was slipped, surveyed and approved for refit and conversion. On 17 November 1947, the vessel was recommissioned into the RAN, renamed Wyatt Earp, and assigned to the ANARE. One of the biggest proponents for the ship’s use in Antarctic research was none other than Sir Douglas Mawson, who recalled its involvement in Ellsworth’s expeditions and thought it well suited to the task. Wyatt Earp subsequently underwent additional modification and refitting, including replacement of rotted hull timbers, enlargement of the forward superstructure, and installation of a semi-diesel engine to replace its original steam propulsion. 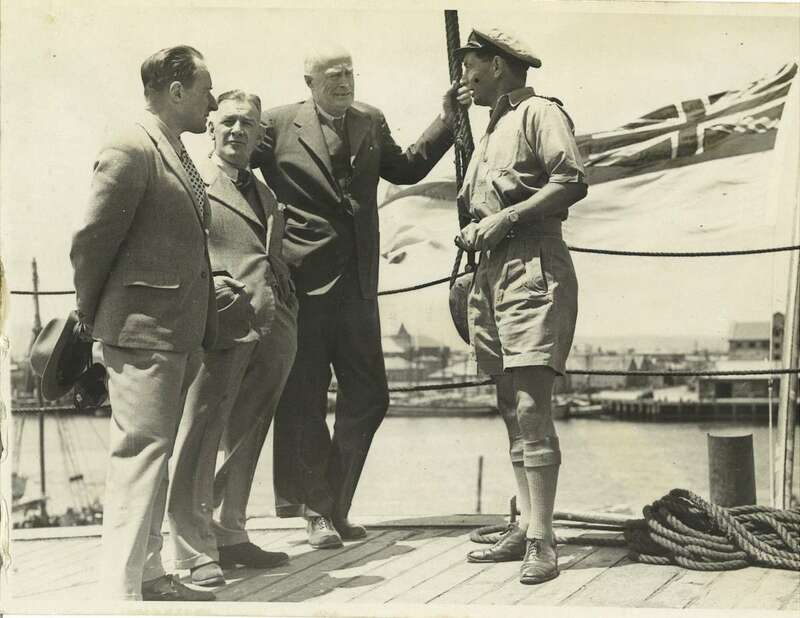 Wyatt Earp’s second-in-command, LCDR William Cook (right), confers with visiting dignitaries on the vessel’s stern at Williamstown, December 1947. Sir Douglas Mawson stands to Cook’s immediate left. ANMM Collection ANMS1445. 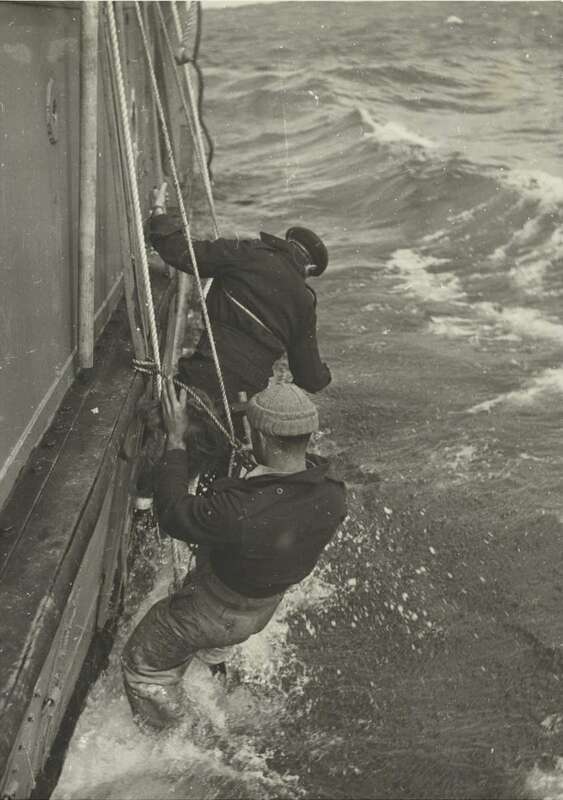 Expedition photograph by Laurence Le Guay showing William Cook (background) and another Wyatt Earp crewman fothering the vessel’s damaged hull, 30 December 1947. ANMM Collection ANMS1445. Wyatt Earp officers and ANARE scientists celebrate during an ‘Across the Circle’ party, February 1948. Left to right: LCDR Harold Irwin (engineer officer), Dr A Bond (medical officer), LCDR William Cook, RAAF Squadron Leader R H Gray (Kingfisher pilot), ASCB John Homewood (boatswain), LT John Yule (watch keeper), and Phillip Law (chief scientific officer). ANMM Collection ANMS1445. For various reasons, Wyatt Earp’s refit fell behind schedule, and by the time the vessel slipped down the ways into the Port River, not enough time remained for it to undergo a proper shakedown cruise. As a consequence, its ANARE voyages were beset with problems – most of which would be traced to the engine and the hull’s tendency to ship water. Indeed, while transiting from Port Adelaide to the naval base at Williamstown in Victoria in early December 1947, Wyatt Earp encountered heavy seas that flooded the aft wardroom and accommodation, put its gyro-compass out of action and disabled the helm. These and other defects were addressed at Williamstown while the ship’s officers entertained visiting military and civilian dignitaries. On 19 December, the vessel finally embarked on its first expedition … and encountered engine trouble within hours of departure. The crew made repairs on the fly and Wyatt Earp continued on to Hobart, where additional defects were attended to by ‘an army of shipwrights’1. Despite efforts to get the expedition under way before Christmas, additional engine trouble kept Wyatt Earp in port until 26 December, when it finally left the River Derwent and sailed straight into a Force 9 gale. Wyatt Earp’s second-in-command for the ANARE voyages was Lieutenant Commander William Cook, a decorated World War II veteran who had served aboard HMAS Perth (I) during its (disrupted) delivery voyage to Australia in 1939, and later on the destroyers HMA Ships Voyager (I) and Vendetta (I) in the Mediterranean and Pacific theatres. He joined Wyatt Earp’s crew in June 1947, while it was still a ‘gutted hulk on the slipway’ at Port Adelaide, and as first officer was responsible for keeping an expedition journal.2 This invaluable record of the first ANARE voyages, as well as several expedition photographs by Laurence Le Guay (who would later be awarded the Australian Photographic Society Commonwealth Medal), a naval cap tally, and an original satirical sketch of Wyatt Earp by political cartoonist Jack Lusby, were kept by Cook at the expedition’s conclusion. Upon Cook’s death in 2003, they were passed to his son Rhod, who kindly donated the collection to the Australian National Maritime Museum in 2015. William Cook’s journal of Wyatt Earp’s ANARE voyages. Note the unofficial ship’s badge at the top of the title page. ANMM Collection 00054702. 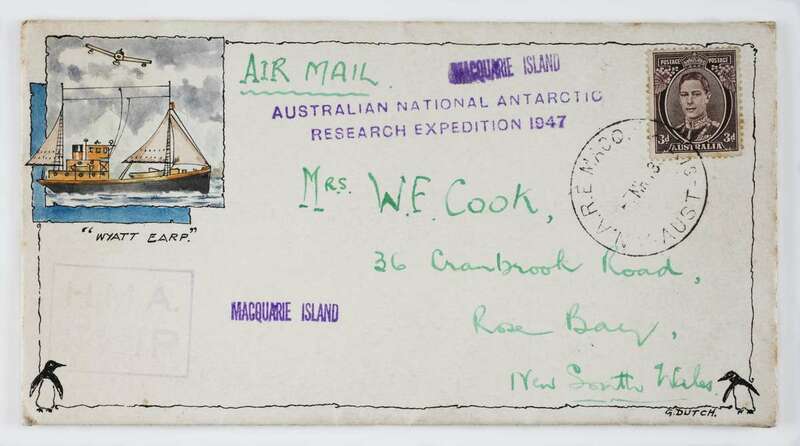 William Cook mailed this envelope to his wife while Wyatt Earp was stationed at Macquarie Island. ANMM Collection ANMS1445. For the remainder of January, the vessel underwent further extensive repairs, including stiffening of the engine bed, replacement of the propeller shaft, renewal of the stern bushings, a complete refit of the main and auxiliary engines, and re-rigging of the steering linkages. In addition, the hull’s metal sheathing was completely removed so that all timber below the waterline could be surveyed. This resulted in partial replacement of the stem post, and re-caulking of the hull and deck planking. 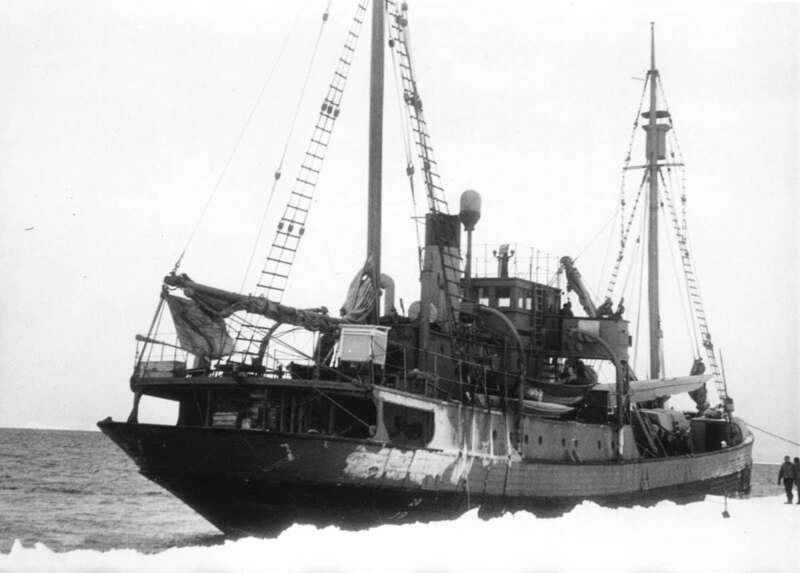 Following brief sea trials, Wyatt Earp departed Port Phillip Bay for a second attempt at Antarctica on 8 February 1948. After a relatively calm and uneventful passage south, it arrived at pack ice on 18 February and was almost immediately struck by a storm that battered the vessel with hurricane-force winds for two days. When the tempest abated, the crew turned the ship into the pack ice and again threaded their way south, coming to within 30 miles (48.3 kilometres) of Antarctica’s Cape Gray. The Kingfisher aircraft was assembled on 22 February, but could not be flown until 13 March, when the weather moderated enough for it to be safely launched and recovered. Two reconnaissance flights revealed impenetrable pack ice between Wyatt Earp and the Antarctic mainland, and the decision was made to instead journey north to Macquarie Island. The ship arrived there seven days later and rendezvoused with LST 3501, a former Royal Navy tank landing ship used to transport ANARE personnel and equipment to Macquarie Island and Heard Island. Wyatt Earp paid off at Melbourne on 30 June 1948 and was sold to Victoria’s Arga Shipping Company in 1951. It was (once again) renamed Wongala, and assigned to the tramp trade between mainland Australian and Tasmanian ports until 1956. Acquired that year by the Ulverstone Shipping Company, the vessel was renamed Natone for a potato-growing district near the Tasmanian town of Ulverstone. It operated in Tasmanian waters for the next 18 months, but was ultimately sent to Queensland, where it transited among the state’s coastal ports. Occasionally, it delivered cargoes to Victoria. HMAS Wyatt Earp underway in Port Phillip Bay, 1947. Photographer Allan C Green, image State Library of Victoria H91.108/3017. On the night of 23 January 1959, while on a voyage from Maryborough, Queensland, to Port Moresby in Papua New Guinea, the vessel’s luck ran out 150 miles (241 km) north of Brisbane. Natone had been battered for two weeks by monsoonal conditions and was inadvertently motoring into the tail end of two cyclones when it began to founder off Queensland’s Double Island Point. In an effort to save his crew, Natone’s captain grounded the ship in shallows off the nearby community of Rainbow Beach. Because it had been strengthened for Antarctic service, Natone held together through the night. Its grounded hull heeled to starboard 30 degrees and was battered incessantly by mountainous waves. The crew of 18 reportedly huddled in the bow before eventually setting off at first light for shore some 280 metres away. As the day progressed, seas remained heavy, and littered the beach with wreckage and equipment. Contemporary newspaper articles note that large numbers of sightseers flocked to Rainbow Beach for souvenirs. Thankfully, no deaths resulted from the disaster, but the vessel was a total loss and eventually broke apart in the storm-fuelled seas. The brief, brutal and bitterly cold career of Australia’s first Antarctic research ship is forever juxtaposed by its final resting place just off a sandy beach in the warm, predominantly calm waters of Queensland’s Sunshine Coast. Wyatt Earp’s/Natone’s remnants are extensively broken up and spread over a vast area. 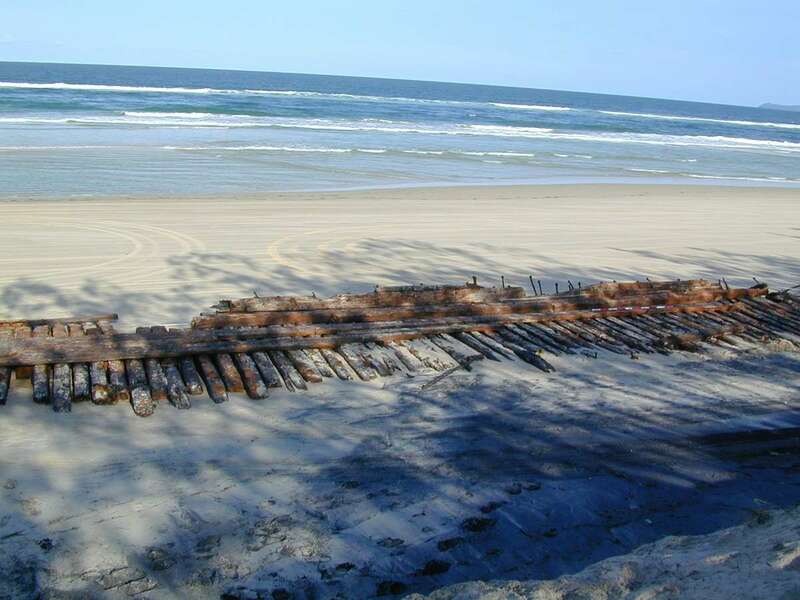 The surviving hull is mostly buried in sand; however, dispersed ship’s timbers on the beach are regularly exposed by heavy seas and/or winds. Their exposure delights locals and tourists alike, who rediscover the shipwreck and its story. The site is also located near the popular MV Natone Camping Area on Inskip Peninsula, and is an oft-visited fishing area. Wooden hull remains believed to be those of MV Natone (ex-Wyatt Earp) at Rainbow Beach, Queensland. Image courtesy Queensland Department of Environment and Heritage Protection. 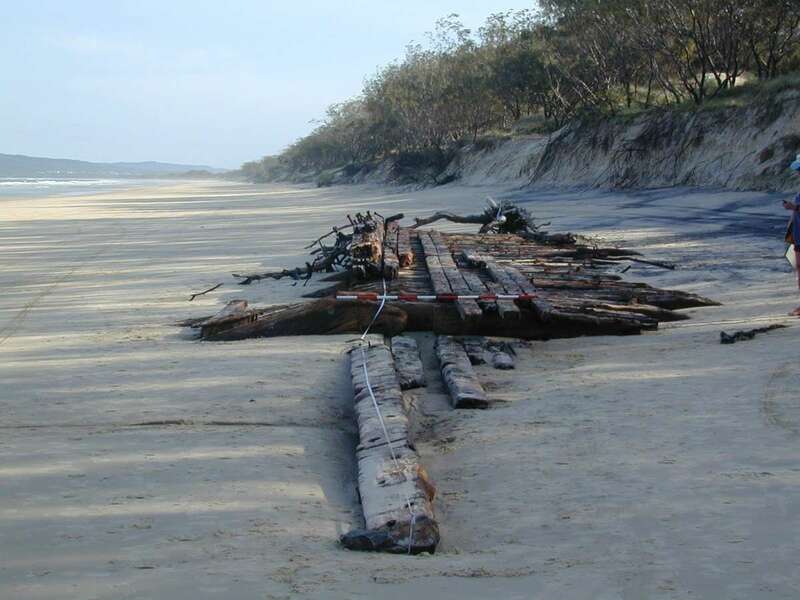 The shipwreck is not currently protected by the Commonwealth’s Historic Shipwrecks Act (1976), but is located within a Queensland protected area estate, and a permit is required to access and conduct research at the site. Wyatt Earp/Natone is also listed within the Australian National Shipwrecks Database (Shipwreck ID No 2917). The vessel’s importance to different individuals, communities and shared heritage stakeholders cannot be understated, as it provides a tangible connection to Australia’s early exploration of Antarctica, as well as the shared polar heritage of Australia and the United States. In addition to its heritage values, the site presently serves as a place of discovery and recreation for visitors to Rainbow Beach. The Twerp’s legacy also lives on in the Antarctic Survey Vessel (ASV) Wyatt Earp, a modified Fantome-class survey launch used by the Australian Hydrographic Service. Launched in 1993, it operates almost exclusively in Antarctic waters, and has been deployed to Antarctica on three different occasions. During its last voyage in 2013–14, ASV Wyatt Earp conducted survey work in the waters around the Australian Antarctic Division’s Casey Station. The Royal Australian Navy’s hydrographic survey vessel Wyatt Earp at Casey Station in Antarctica. Image: Martin Riddle/ Royal Australian Navy. — Dr. James Hunter, Curator RAN Maritime Archaeology with Emily Jateff, Curator Ocean, Science and Technology & Andy Viduka, Historic Shipwrecks Program, Australian Government Department of the Environment and Energy. This article originally appeared in Signals 121 (December 2017). Uncover more maritime history and stories in our quarterly magazine Signals. 1 W F Cook, 1978, ‘HMAS Wyatt Earp – Antarctic Research 1947–1948’, Naval Historical Review 2(2): 9. 5 Cook, HMAS Wyatt Earp, p 11. 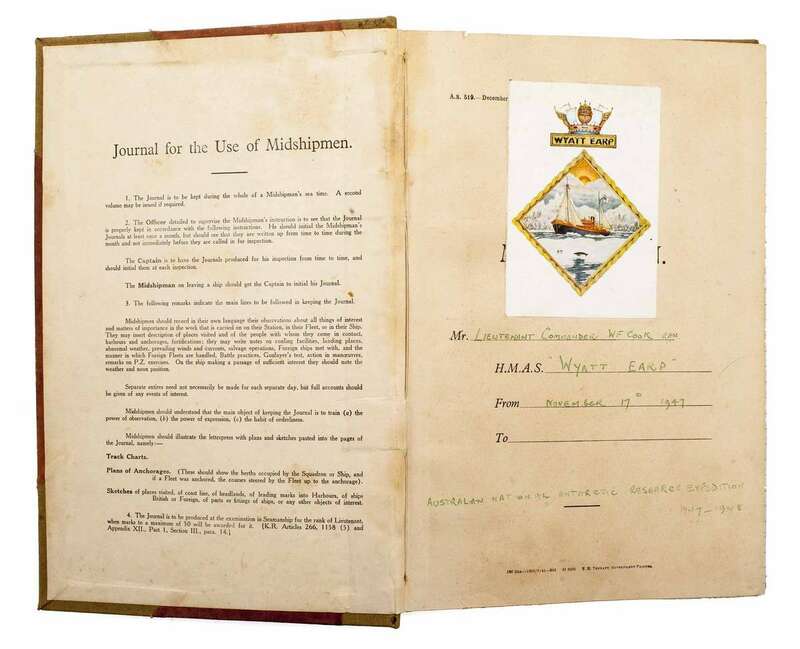 7 Cook, Journal of the Voyage of HMAS Wyatt Earp, pp 74–75. 8 Cook, ‘HMAS Wyatt Earp’, p 17. 9 K E Oom (CDR), 1948, HMAS Wyatt Earp: Report of Proceedings (1 April 1948), National Archives of Australia (P1557, 22/2). W Cook, 1990, ‘HMAS Wyatt Earp and the Australian National Antarctic Research Expedition, 1947–1948’, The Great Circle 12(2): 98–102. P Law, 1995, The Antarctic Voyage of HMAS Wyatt Earp, Allen & Unwin, Sydney. L Shaw, 2003, ‘No Heroics, No Deaths: Little-Known Antarctic Heroes’, Signals 62: 9–11. The Canberra Times, ‘Violent seas wreck former Wyatt Earp’, 26 January 1959, p 1. The Canberra Times, ‘Watchman on Wrecked Ship’, 27 January 1959, p 15. P Worsley, 2011, ‘HMAS Wyatt Earp’, Maritime Heritage Association Journal 22(4): 2. Wyatt Earp/Natone, Australian National Shipwrecks Database.